September has just begun, but we are well on the way to preparing for Halloween festivities. Halloween is the perfect time to bring out the wacky, scary decorations. It is also a great time for Halloween parties and celebrations. What good is a party without a Halloween themed bounce house? UltimateJumpers.com is the most reliable bounce house manufacturer in Los Angeles. They are a professional Halloween Pumpkin Bounce House Seller. Inflatable Halloween Jumper: This fun bounce house comes in three different sizes so you can choose the one that best fits your budget and market. Kids will love jumping and playing for hours in this Inflatable Halloween Jumper! Spooky Town Bouncer Slide Combo: This combo unit has it all! Two slides on either side of the bouncer make this Halloween Bouncer Slide Combo incredibly fun and entertaining. Inflatable Front Load Halloween Slide: This inflatable Halloween slide is perfect for kids and adults alike! Party goers will love sliding down this fun inflatable in there Halloween costumes! 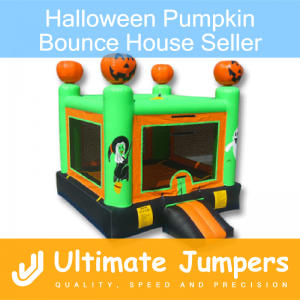 If you are looking for a Halloween Pumpkin Bounce House Seller, look no further than UltimateJumpers.com. The quality of our units combined with the amazing price will make your purchase a great business investment.